MainAll NewsDefense/SecurityDeadly terror attack - or fatal accident? Deadly terror attack - or fatal accident? Officers who shot and killed Bedouin driver who hit police during home demolition won't face criminal charges. Nearly sixteen months after an Israeli police officer and Bedouin driver were killed during the demolition of illegal homes in Bedouin settlement in southern Israel, key events during the deadly confrontation remain shrouded in mystery. 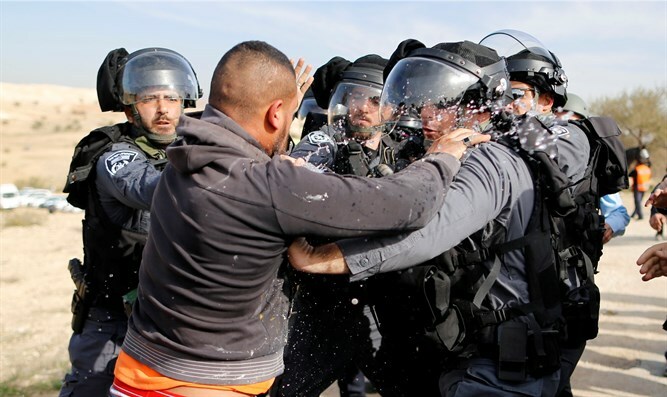 Before dawn on Wednesday, January 18th, 2017, Israeli security forces and law enforcement officials gathered outside of the illegal Bedouin settlement of Umm al-Hiran in the Negev. During the subsequent demolition operation, rioters clashed with security forces, hurling stones and attempting to block police vehicles. At one point during the confrontations, a car was spotted driving towards officers deployed in the village to secure the operation. As the car approached, officers opened fire, and the vehicle rammed into two security personnel. Thirty-four-year-old police Sergeant Erez Levy was killed, while a second officer was injured. Officers shot and killed the driver, Yaqoub Abu al-Qiaan, a resident of Umm al-Hiran. The incident was initially treated as an act of terror, with Israeli security officials citing al-Qiaan’s ties to the Islamic Movement in Israel, and claiming he had been inspired by ISIS. While police maintained that al-Qiaan had carried out a terror attack and intentionally targeted the police, noting that he had driven towards the officers and accelerated as he approached them, investigators failed to conclusively determine the nature of the incident. “We believe it was a terrorist attack, and we will let the Police Investigative Division finish its investigation,” said police spokeswoman Meirav Lapidot. “Even with everything we know today, we cannot provide a different answer to what happened. We, as the police, have never changed our version." Doubts persisted, nevertheless, after it was discovered that al-Qiaan had been wounded in the leg prior to hitting the officers, suggesting that the sudden acceleration of his vehicle prior to impact may have been inadvertent. On Tuesday, state prosecutor Shai Nitzan ruled that the nature of the incident cannot be determined, and that the case will be closed. While the decision leaves open questions regarding al-Qiaan’s actions, it removes the threat of criminal prosecution from the officers involved in the shooting. According to the decision, the officers who opened fire on al-Qiaan had justifiable concern at the time, with no basis for criminal charges over the death of al-Qiaan.